Last week I talked about effectively listening to co-workers as a way to build strong relationships on which to rest training and feedback. 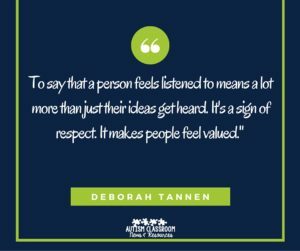 I talked about 5 ways you could listen effectively to mend and enhance your relationships with classroom staff. Today I want to talk about listening habits that might be sabotaging your relationships. Don’t have time to read the post? Pin this image for later or listen to the video from the Facebook Live session at the end of the post [you can run it and just listen while you are doing something else). As I talked about, in order to provide training and feedback effectively in the classroom, you must have built a good relationship to provide context. No one wants to receive criticism, even constructive feedback, if they don’t trust the person giving it. For a quick overview of the importance of listening in building a relationship, check out this video from Aubrey Daniels. 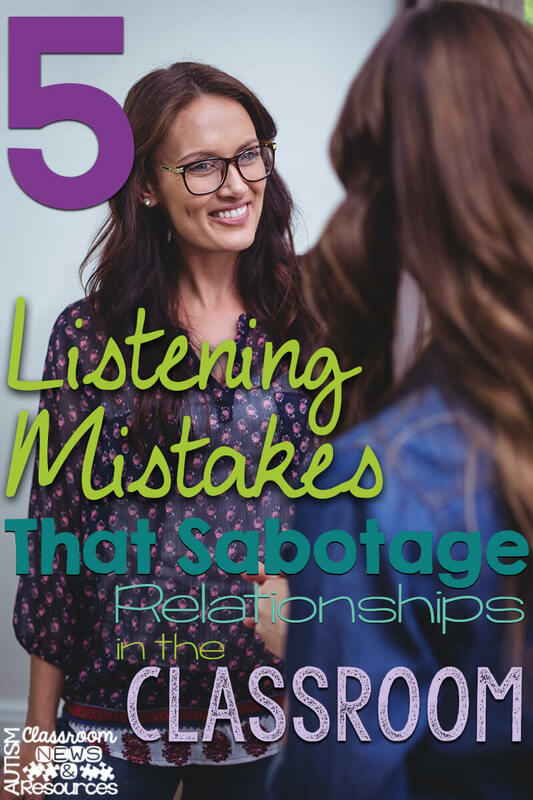 So, I’ve talked about the DOs of listening; let’s look at the listening habits or behaviors that may be sabotaging your efforts to build relationships with other educators. These are the Don’ts of Effective Listening. People stalk the conversation when they are listening but anticipating what the other person is going to say rather than actually hearing them. Have you ever tried to finish someone’s sentence for them in a conversation? If so you were stalking the conversation rather than listening…you were anticipating what they were going to say. 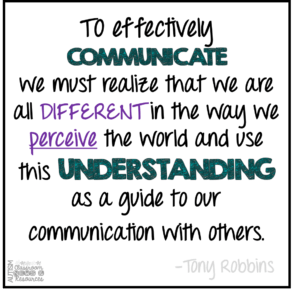 Now have you ever done that and had the other person say, exasperated, “No that’s not what I’m saying!” Nothing is more frustrating when you are trying to make yourself heard than to have the listener clearly not be on the same page but also not listening to where you are on the page. When you listen, just listen. It will take some practice. We have all stalked the conversation at one time or another, but when you do it too often you get a reputation of someone who isn’t really listening. And research indicates that workers perform better when their supervisors (or in many of our cases, nonsupervisors) listen to them. Just as you don’t want to be anticipating what the other person says in the conversation, don’t be thinking about how you are going to respond while the person is still talking. I know this is a really hard one to do and we all do it at times. I struggle with it. It may slow the conversation down a bit to have to think about what you are going to say after they finish. However, the conversation will be more productive, and ultimately more efficient, because you will be hearing each other. However, when you do this the following results can happen. It’s clear to the other person that you are not listening to them, because you are not engaging in good listening behaviors (because you aren’t listening, you are thinking). In other words, don’t assume that the other person’s experiences are just like yours. Chances are good that their past experiences are very different than your own. For instance, let’s say you are an instructional coach providing support to teachers all over the district. It’s highly unlikely that you all come from the same socio-economic background, that your family histories are similar, or that even your reasons for teaching are the same. You may be a highly motivated teacher who is single and has dedicated most of your time to the job. You stay late after school and on weekends because you love your job and at this time in your life you don’t have competing responsibilities (e.g., children). Your situation is significantly different than the teacher who is a single mother, supporting 3 children on her own and taking care of her aging mother who lives with her. You likely have very different perspectives on time management and the job. The differences aren’t bad; they are just different. Don’t assume that everyone is coming at a problem with the same perspective you are…because they are not. And you will only find out their perspective when you LISTEN to them. As I noted earlier, staff work better for “bosses” or supervisors that ask for their opinion and take it seriously. In order to do this, you not only have to hear what they are saying but not immediately shoot it down. If you never take their suggestions into consideration, then there is no reason for them to share them with you. Don’t be the person that staff says, “Yea, she asks for our opinion all the time, but she never listens to it.” Or the one that causes them to say, “Why bother giving her your opinion…she never does anything with it.” And I would say that you want to go the extra step on this point. Not only do you want to consider their suggestions and adopt some of them, you want to publicly acknowledge them when you do so. Give them the credit for the idea and they will be more likely to generate solution-oriented discussions rather than complaints. If someone is talking to you about how to schedule the staff in a classroom, don’t focus in on the one little thing they said about another staff member or something that is not relevant to the discussion. For instance, you and Sarah are talking about how to make sure that a specific student is supervised throughout the day. During the conversation, Sarah makes a comment about how one of the other staff dresses in a way she considers to be inappropriate. It would be easy to get sidetracked in this situation and either end up gossiping about the attire of the other staff member or explaining to Sarah why she shouldn’t concern herself with it. In reality…it’s not relevant to the conversation. If you think it’s something you need to address at some point, make a note and come back to it some other time. Allowing yourself to get diverted prolongs the conversation and, again, sends a message to Sarah that her opinions about the other staff members is more important that the solution to the problem. So stay on point and make your interactions count. Part of leading a team in the classroom or anywhere else is developing a relationship in which information flows both ways and people feel heard. I will talk later in this series about the dos/don’ts of reinforcing staff for their work in the classroom, but having someone listen to you and seeing a suggestion they have made improve the classroom can be extremely rewarding for staff. It empowers them to know that they are making a difference and it’s one of the few reinforcers that we, as “nonsupervisors” who are supervising (i.e., changing adults’ behaviors), have the ability to control and implement. See something you like? I would love to know if this is helpful to you. If you didn’t get to join in our discussion in Facebook Live on Sunday, you can check out the video below. Make sure to check out the comments by clicking below the video to see the questions and other ideas. I hope you’ll join us for our next session, Sunday at 7 on my Facebook page. Could you just sit on my shoulder and whack me when I just hear part of what was said. I have really had to use your techniques the last month or so. I really appreciate your posts and they have helped me be a better manager.